This show was broadcast June 19, 2014. 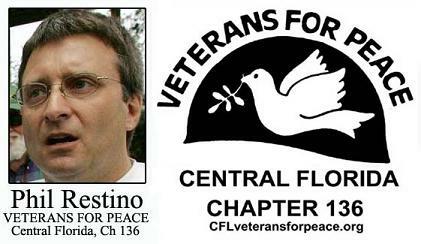 Phil Restino is a peacetime veteran who founded the central Florida chapter of Veterans For Peace. As well, he is a co-host of the show “We cannot be silent”. In this week’s episode of 9/11 Free Fall he discusses the latest debate over re-invading Iraq, the psychology of young men– which military recruiters tap into to get them to enlist– and what he saw as a purposeful marginalizing of 9/11 Truth by leaders of the antiwar movement. He also discusses how he believes these same leaders weakened the antiwar movement with their partisanship and hypocrisy. This entry was posted on Thursday, June 19th, 2014 at 12:23 am	and is filed under 9/11, 911 Free Fall, Anti-War, Freedom, Justice, News, Protest, War Crimes. You can follow any responses to this entry through the RSS 2.0 feed.